Cloud Blowing Wind: What Does that Mean to You? Search for more about weather. If you need an example of a cloud blowing wind, how about a Föhn wind? Some people spell it a foehn wind instead. Regardless of its geographic location, and therefore its local name, the physics is basically the same for all winds of this type. What makes the area on downwind side of a mountain range so dry? That is, downwind with respect to the prevailing wind direction. So the story goes, moist air receives a push up a mountain, an orographic lift, and expands and cools in an adiabatic fashion. Precipitation falls from it and releases potent latent heat which remains in the air. The leftover heat changes the adiabatic properties of the expansion significantly. As it descends on the dry side of the ridge, as a katabatic wind, it warms up faster than it cooled in the first place and stays very dry. What's left is a strong, warm and dehydrating breeze, creating ideal conditions for fires and desertification. The Santa Ana Winds of California are a prime example of this phenomenon. Also the Chinook winds of western North America. People in other parts of the world, where mountains rise into the sky, have given them colourful names such as Halny, Viento Sur, and Terral in Europe. Southern hemisphere inhabitants have used words like Zonda, Nor'wester and Bergwind. If a thick cloud cover lies over the lee side of the mountains, the breeze slowly moves it downwind. As time progresses, a gap appears and then widens between the cover and the horizon on the upwind side. The cloud blowing wind leaves a distinctive curved trace around the edge of the overhead shield. In the Great Plains, forinstance, we call that a chinook arch. They make for spectacular photographs. Because of the dry wind, there is not a lot of cloud and precipitation is sparse. The arch and its stratus cloud covers most of the sky, but not with thick clouds. And surprisingly many clouds do not move much in spite of what SHOULD be a cloud blowing wind. Take the thick but quasi-stationary wall clouds that can lie upwind for instance. The lower clouds in the picture may be the beginnings of a good wall cloud. And those higher ones may consist of cap clouds or downwind lenticular clouds. 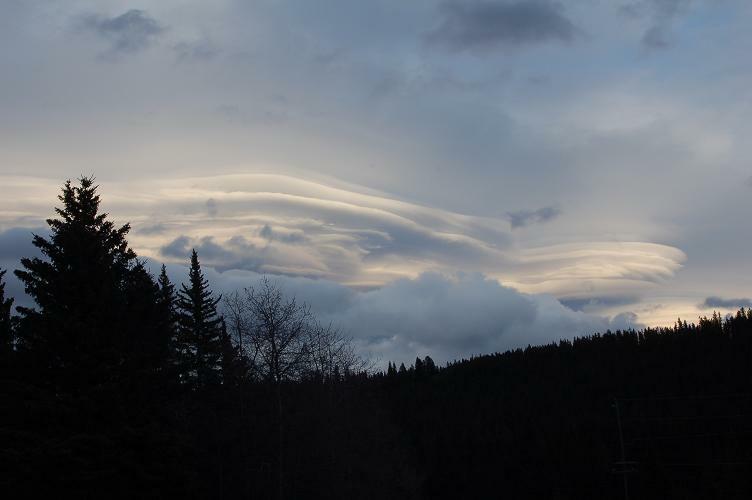 Even more interesting, the chinook winds blow through many types of clouds without moving them at all. The wind doesn't appear to move atmospheric waves for instance. Lenticular clouds form on the lee (downwind) side of mountains. After making the difficult climb up the range, the wind races down the other side. Then it hits the bottom and bounces back up, creating a wave. A standing wave, as the wave does not travel anywhere even though the air does. You can see a similar wave in a river downstream from a weir. As the air makes this second crest (the first being over the hill itself, where the cap cloud forms), a stationary cloud can develop. It often highlights only the very top of the lee wave and therefore looks like a contact lens viewed from the side. Narrow at both ends and wider in the middle but curved. These clouds form at around 7 to 10 thousand feet above sea level, ASL, and are convective in structure. That means they take place in air rising faster than the surrounding air, as it would riding this wave. Put all of these facts together and you have Altocumulus Standing Lenticularis, or ACSL for short. Another product of our cloud blowing wind. Go back from Cloud Blowing Wind to the Weather Equipment web page, or visit the Stuff in the Air homepage.